The World Short Track Championships are well underway in Sheffield, England so we’re bringing our contest to a close. This final question about Katherine Reutter was originally supposed to be the toughest of them all, but we’re going to take a different approach. So that everyone has at least one entry to the contest, all you need to do is leave a comment with your answer to the question below. Question of the Day: How does Katherine inspire you? To enter the contest, leave a comment with your answer below the post with your answer to that day’s question. Winners will be selected and announced on March 14th, 2011. The grand prize will be awarded if the prize requirement of 300 or more total comments is met. Let me count the ways! But a recent incident stands out – Katherine was raised on the mantra ‘What would you do if you weren’t afraid?’ A few weeks ago she asked if I’d go to Warsaw, Poland for World Team Championships – I balked because it meant traveling by myself to a non-English speaking country. Well, what goes around comes around – at my hesitancy Katherine said ‘Mom, what would you do if you weren’t afraid?’! Talk about inspiring – I’m headed to Warsaw to cheer on Team USA! In absolutely every way!! A true role model whatever your age. Living in Utah and skating with the Utah Olympic Oval club team, I see Katherine around the rink frequently, and she is always out there working hard. I don’t know how many times I have seen her riding the stationary bikes, running laps on the track, or using the turn belt all by herself with no one else around, putting in that extra work that makes all the difference. That kind of work ethic is inspiring–and contagious! Way to be, Katherine. Katherine has done what most kids only dream of doing. She put work behind her dreams to get to where she is today and had support of family and friends. But she had to reach down deep inside many times to go on. She strived to be the best she could be. We all need to be the best we can be. And yes we may need family and friends at times to help us. But we have to strive like Katherine, we may not all be in the public like she is. But we know we are a star! God Bless you Katherine. I met Katherine at the 2009 National Championships was inspired by her hospitality. She was so kind and welcoming to all her fans. I’m pretty shy, but I remember making a mental-note to be more outgoing like Katherine. Also, as an athlete myself, I’m inspired by her dedication to her sport and her ability to come back after an injury. I admire her positivity. Good Luck at Worlds, Katherine! By humbly overcoming injuries and obstacles and not making excuses she has started to dominate a sport traditionally controlled by other nations. She inpires all that follow her progress to dig a little deeper and be a little better in their own way.. She has made the U.S. proud!! Plus it is awesome that she hails from my hometown – Champaign, IL. Go Katherine!! By her hard work, drive and determination to win. She is definitely inspiring! In the last Olympics I was rootin’ for her to win and when she did she let out a big scream! Way to go Katherine! Hope you can do it again in London! As a short track speedskater myself, Katherine proves to me that the sky is the limit! Her dedication and work ethic shows in her results. When I am on the ice and start to feel tired I think WWRD (What Would Reutter Do?) and push myself further. Thanks Katherine!! i have watched this young lady blossom since 2009. She has inspired all young ladys and boys that if you put your heart and soul into something you can do anything you want in this world. She opened my eyes to speed skating, she is one wonderful young lady. I show her videos to all of our young up can coming skaters to show them this is the right way you do it. Katherine you are amazing. Keep it up! Unlike a certain star in the news recently, Katherine brings a good name to the term “winning”. 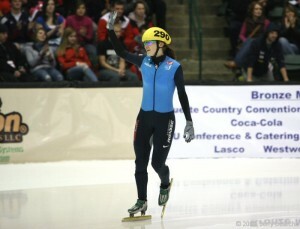 But most of all is the joy she seems to take from training and competing and being a skater–there is a quote at the Petit Center in Milwaukee from figure skater Peggy Fleming about the most important thing is to love your sport–it seems to apply to Katherine and short track speed skating. Her hard work and love for her family. Katherine seems tireless and gracious always. Katherine has exemplified giving what she does 100% – and not focusing on not winning the race – but learning from it and improving. She doesn’t give up, she gets up and goes again and again and again. How many of us try and give up when it isn’t easy? We only get better – at who we are and what we do – by failing and learning from our failures and trying again and again. You only lose when you don’t get up and keep going. Katherine just keeps getting better at her sport and at life in general. She’s a delightful young woman! The respect and adoration that she has given to her parents. She took all her winnings from the games and gave it to her parents, because of everything that they did for her she wanted to do something great for them too. She is a champion in heart and soul, in her physical challenges, and in her love for her family and her country. I admire that. Katherine, barely out of anesthesia after her surgery, got up and about and insisted on doing things for herself – wouldn’t let anybody coddle her. On that day she exemplified her mantra “If you rest, you rust”, and I’ll never forget that. Katherine inspires me by being a perfect role model. She’s humble and confident and determined. So many athletes these days are hung up on money or themselves, so it’s great to find an athlete who is all about the sport and the fans. We’re all cheering for you, Katherine! Katherine is my hero. I don’t care how old you are. From the day I first met her in December, 2007 I’ve been inspired by her. Her love for her family is tops in my book. She is so grateful for all that comes her way, including her fans. And she knows that she cannot take her athletic ability for granted. She pushes herself to strive for the top. I am proud to wear my Green and root for Katherine. Katherine inspires me by her kindness, generosity, how genuine she is, her ability to set goals and achieve them through her, motivation, dedication, discipline, focus on hard work, determination and never giving up(I’m sure that isn’t even a thought of hers). I am just so proud of her that only her parents and grandparents could possibly be prouder!!! Her dedication to her sport, grace and sportsmanship, and the appreciation and love she gives to her family and friends. She’s also an absolutely amazing skater and inspires me to pursue my own dreams. I often find myself saying, “Oh well, I’ll begin tomorrow.” When Katherine sets a goal for skating she never puts off “until tomorrow” because she needs to do it today in order to build on it tomorrow. Her apartment is plastered with quotations that she believes and practices daily. When she moved to Marquette to training, she was only sixteen, ready for her senior year, and an only child. Any of those would have discouraged others but she’s told me how hard that yeaar was for her. Grandma, I called home and cried , but I never cried to come home. She has what a true champion has to have–passion for what she believes in and the action to make it happen. I have never had the opportunity to meet Katherine but her excitement after winning the silver medal at the Olympics was so inspiring, I wish more people were that excited to get silver medal- instead of the ones who take it off in disgust. Finally, congrats on your success in England, it was well deserved.